EDMONTON - Jesse Joensuu is having another strong pre-season for the Edmonton Oilers. Now he just needs to make that translate to the regular season as well. Joensuu had a pair of goals as the Oilers managed a 3-2 victory over the Arizona Coyotes in pre-season play on Wednesday. "I think our whole line played really well, it was a line effort, both goals," Joensuu said. "Either they were really, really good or they weren't defending me really well. They were both really similar." The 26-year-old Finnish forward scored three goals in exhibition play last year before recording just three goals and five points in 42 games in the regular season. Those numbers put him on the bubble for a spot with the team this year. "I'm not that good that I don't have to play well in training camp," he said. Benoit Pouliot also scored for the Oilers, who improved to 4-2-0 in exhibition action. "It was one of those nights where we didn't have very many complaints," said Oilers head coach Dallas Eakins. "All the guys in the lineup showed very well. The pace was there, the execution was there, the hiccups along the way were few and far between." Mikkel Boedker and Rob Klinkhammer replied for the Coyotes, who dropped to 4-1-2. "I didn't think we played as well tonight as we did the other night in Vancouver," said Coyotes coach Dave Tippett. "We were taking a last look at five or six young players who were pushing for lineup spots. "We didn't win enough battles and our execution with the puck was poor at times and got us in some trouble." The game was a bit of a surreal experience for Arizona goalie Devan Dubnyk, who looks like a lock for the backup goalie job in Arizona after a tumultuous season last year that saw him unsuccessfully begin the year as the Oilers starter, get traded to Nashville and then to Montreal, where he ended the season with the Habs' AHL squad in Hamilton. "I saw a lot of pucks in the first, which helped me forget about the strangeness of the situation," said Dubnyk, who made 30 saves on the night. "I felt weird for the first couple minutes, but that was it. I didn't let myself build it up too much and was able to enjoy it. I tried to just treat this as another game. It was definitely nice to get it out of the way and I'll definitely work hard to get the two points next time when it matters." Arizona started the scoring midway through the first period when Oilers starter Ben Scrivens made the stop on a point shot by Connor Murphy, but got caught up in traffic in front of the net for the rebound — allowing Boedker to lift the puck into the net. Scrivens almost got caught off guard for a second goal with two minutes left in the opening period when he missed on a poke check attempt on Tobias Rieder. He was able to recover, however, to make a diving save and then another stop on Rieder on the doorstep seconds later. They turned out to be big stops as the Oilers then skated up-ice on a rush. Dubnyk was able to make the initial stop on a shot by Teddy Purcell, but was unable to prevent Pouliot from lifting in the rebound to make it 1-1. The Oilers had another great opportunity with 25 seconds remaining as Brandon Gormley hooked Matt Hendricks on a breakaway, leading to a penalty shot. However, Dubnyk easily made the save on the one-on-one encounter. Edmonton outshot Arizona 17-8 through 20 minutes. The Oilers took a 2-1 lead two minutes into the second period after Steve Pinizzotto slid a puck in front and Joensuu was able to put a quick snap shot through Dubnyk's legs. Edmonton had a bit of a scare when forward David Perron was crushed in a mid-ice hit by Arizona defender Matt Smaby and had trouble getting up. After heading down the ramp, Perron would return a few minutes later and finished the second, but did not come back for the third with a rib injury. The Coyotes tied the game with eight minutes remaining in the second when Klinkhammer elected to shoot on a two-on-one break, beating Scrivens with a well-placed shot to the top corner. Edmonton came close to regaining the lead with just over five minutes left in the second period when Darnell Nurse rang a shot off the post on the power play. The Oilers made it 3-2 early in the third when Pinizzotto took the puck behind the net and fed it into the slot for Joensuu, who zipped the puck past Dubnyk. 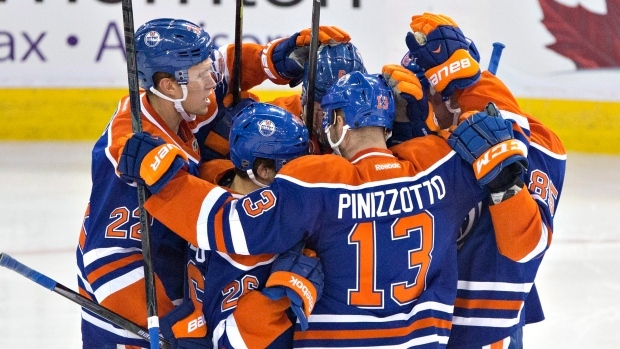 The Oilers continue the pre-season schedule on Thursday night as they host the Vancouver Canucks. The Coyotes play their final exhibition match-up on Friday when they host the San Jose Sharks.